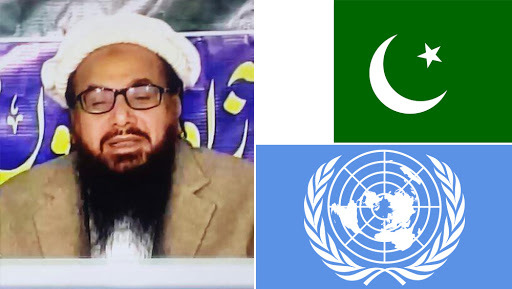 New Delhi, March 7: With the United Nations rejecting an appeal by the 2008 Mumbai terror attack mastermind to remove his name from a list of banned terrorists, Pakistan administration on Thursday had blocked visa requests of UN officials from interviewing Hafiz Saeed. Since the proposal to de-list Jamaat-ud-Dawa chief from the UN sanction list was denied, the new development comes into place. According to the initial information, the Pakistan government has quashed the proposal of the UN officials to interview Saeed, following the UN quoted the requirement that their officials need to interview the JuD chief, so that proposal to de-list Saeed from sanction list can be mandated. UN Rejects Hafiz Saeed's Plea for Removal from List of Banned Terrorists: Govt Sources. The major development comes two days after the Pakistan government banned the terror group and its affiliate Falah-e-Insaniat Foundation under the Anti Terrorism Act 1997. Acting on the detailed evidence provided by the Indian government – including ‘highly confidential information’ – the UN had earlier decided to list Saeed in the banned terrorist list. Taking cognisance of the ‘confidential information’ sent by the Indian government, the UN Security Council had imposed a ban on Saeed on December 10, 2008. After that, Saeed had filed an appeal to the UNSC through a Lahore-based firm Mirza and Mirza in 2017. To take the case forward, UN had appointed independent Ombudsperson Daniel Kipfer Frascati, and he informed Saeed’s lawyer Haider Rasul Mirza that the JuD chief would ‘continue as a listed individual’ in UN-designated terrorist list. Daniel Kipfer Fasciati had added that the ban would continue based on the ‘sufficient information’. Also, he stated that the recommendation was endorsed by the United Nations Sanctions Committee. As per reports, Saeed’s request was opposed by India as well as other countries that had originally listed him – US, UK and France. The latest development comes amid the ongoing tension between India-Pakistan after Pulwama terror attack in which 40 CRPF personnel were killed. Pakistan-based JeM had claimed responsibility for the strike and UN’s 1267 Sanctions Committee had received a new request to ban Jaish-e-Mohammad chief Masood Azhar as it has taken the responsibility of the attack.